Get out to the Game Trucks and give Super Mario Maker a test run! After providing a truckload of ink-flying action to parties across the country this summer with the Splatoon game, GameTruck is once again partnering with Nintendo to bring the Super Mario Maker game to its fleet of game trucks. Starting on Sept. 18, more than 100 GameTruck vehicles will feature the upcoming game, launching exclusively for Wii U consoles on the 11th of September. Super Mario Maker lets players create their own Super Mario Bros. levels, share them online and play a near-limitless number of levels from people all over the world. GameTruck delivers a fun video game experience to major metropolitan areas in 27 states around the country. The trucks bring gaming experiences directly to private consumer events and parties with more than 100 trucks fully equipped with the latest video games. There are even game experts on board to give tips, tricks and training. The trucks roll right up to the location of the party to provide a no-hassle way for party planners to give their attendees a fun experience they’ll never forget. To date, GameTruck has brought the Splatoon game in all of its inky glory to more than 5,000 parties and nearly 1,500 large events, while entertaining a total of over 600,000 guests. Party guests who play Super Mario Maker in the trucks will experience a variety of imaginative levels created by people all over the world – even some created by Nintendo! GameTruck’s onboard experts will guide party guests through the level-creation process so they can get a taste of how easy and fun it is to create the Super Mario Bros. levels of their dreams. Attendees will even be able to submit their best levels to GameTruck at the end of their party, for a chance to have their level shared across the country. Once a month, GameTruck and Nintendo will select the best created level and feature it on http://play.nintendo.com. The trucks with Super Mario Maker won’t hit the road until Sept. 18, but party planners can start reserving them now. 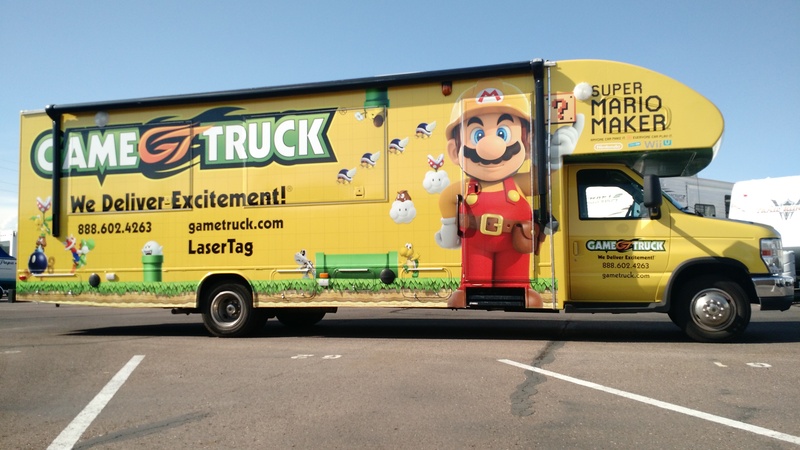 For more information about how to reserve a GameTruck featuring Super Mario Maker, please visit http://gametruckparty.com.